Announcement Welcome to Rag Quilts by Julie! I specialize in finding pretty fabrics for my quilts and totes ~ gorgeous florals, colorful homespun plaids, and beautiful holiday fabrics! Production time for custom and made to order is 2-4 weeks at this time. Welcome to Rag Quilts by Julie! I specialize in finding pretty fabrics for my quilts and totes ~ gorgeous florals, colorful homespun plaids, and beautiful holiday fabrics! Production time for custom and made to order is 2-4 weeks at this time. quick to ship, exactly as pictured. thanks! A+++++ Super friendly and easy to work with!!! I will definitely purchase from this shop in the future!!! these pretty fabrics are ready to be pinned together to get another rag quilt started. My grandma was my inspiration! She was a beautiful, talented seamstress. I've wanted to be like my mom and grandma, the two most creative women I've known, for as long as I can remember. My mom was always sewing clothes for my siblings and me. We never had a holiday without matching outfits when I was little. :) My grandma was a professional seamstress. For as far back as I can remember, she was sewing. Doing alterations in her home, people going in and out with clothes for her to tailor. She even made the bridesmaid dresses for my wedding. I did a little bit of sewing when I was young and made a few maternity outfits when I was pregnant and little dresses for my girls. But, it wasn't until about 11 years ago when I saw a segment on TV about rag quilting that I knew I needed to learn that. 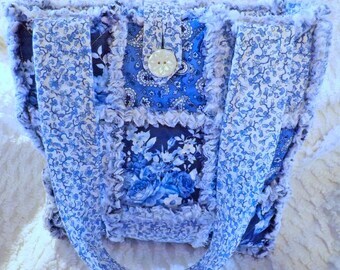 I made purse after purse until I felt confident enough to sell them. Found Etsy and it's been fun ever since. I'm living my dream and I think my mom and grandma would be very happy. Married 40 years to my dear husband, Paul. We have two grown daughters. I love being home all day sewing and creating pretty things. To fulfill your order, you must provide me with certain information (which you authorized Etsy to provide to me), such as your name, email address, postal address, payment information and the details of the product that you’re ordering. You may also choose to provide me with additional personal information for a custom order. 1) Change, restrict, delete. You may also have rights to change, restrict my use of, or delete your personal information. Absent exceptional circumstances (like where I am required to store data for legal reasons) I will generally delete your personal information upon request. 2) Object. You can object to (i) my processing of some of your information based on my legitimate interests and (ii) receiving marketing messages from me after providing your express consent to receive them. In such cases, I will delete your personal information unless I have compelling and legitimate grounds to continue using that information or if it is needed for legal reasons. For purposes of EU data protection law, I, Julie Vogler, am the data controller of your personal information. If you have any questions or concerns, you may contact me at julie@ragquiltsbyjulie.com or by etsy messaging convos. Etsy messaging is the best way to contact me as there will be a record kept by Etsy if needed for proof of any complaint or communication for any dispute. My mailing address will be available on the customer receipt when a purchase is made from my shop. Missouri residents will have a 6.725% sales tax added to their order. Etsy will collect tax from a few other states that have changed their laws for sales tax. What are your domestic and international shipping policies? PROCESSING AND SHIPPING TIME does not include weekends or holidays. Please make sure to order item with this consideration to avoid delays. DOMESTIC SHIPPING: Items will be sent Priority Mail with Free Delivery Confirmation. Some smaller items will be sent First Class with D.C. All items are insured. DOMESTIC ORDERS OVER $500: All orders over $500 will need to be sent with signature confirmation. INTERNATIONAL SHIPPING: For International customers, your item will be shipped First Class Int'l or Priority Int'l. All items are insured. Heavier items will need to be sent Priority Int'l. What is your international shipping, VAT and customs fee policy? Etsy shows text "VAT included (where applicable)" under price of items that ship to the EU. That is a general statement which only applies to EU sellers who are VAT registered. I live in the USA, not VAT registered, no VAT is included in price for any of my items. You will need to pay VAT and add'l charges upon receipt. I will need to fill customs form out properly, not as a gift. If item is returned, not claimed for any reason(customer does not want to pay customs/VAT fees, shipping address not current, etc. ), I'll refund minus original shipping and shipping costs incurred by postal service for returning package only if item arrives back to me in excellent condition, just as originally shipped. CUSTOM ORDERS not included in this policy. ALL packages are insured for loss or damage either through USPS, a third party insurer, or personally by me. I want your package to get to you safely and intact. International orders are insured through a third party insurance company. If ANY package arrives damaged, PLEASE make sure to keep everything INCLUDING the packaging and let me know as soon as possible. If I used USPS or a third party insurer, you may receive a letter that will need to be signed and returned to the insurance company confirming the damage or loss. A refund will be made after insurance forms that need to be completed by buyer are filled out and submitted. Pictures may need to be taken of package. Returns are handled on individual basis. Your items have been packaged with care and sent in excellent condition. Yet, sometimes accidents happen with shipment. If purchase arrives damaged, please contact me right away, so we can make arrangements for a refund. Keep item including packaging for insurance purposes. Refund will be made after insurance forms that need to be completed by buyer are filled out and submitted. If item arrives in good condition and you are not happy with it, contact me within 7 days of receiving the item. Please ship item back within 14 days in excellent, unused condition, insured, and packaged properly. Return shipping not included in refund. Exchanges can be made, but I will need to charge difference and shipping. 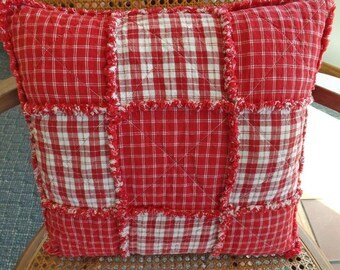 All dimensions for quilts are approximate and can sometimes be slightly off from listed measurements. Some cotton fabrics can shrink more than others. I won't be able to guarantee exact measurements, but it'll be as close as possible to stated dimensions. I will let you know if any of the sides of your quilt are more than 4 inches off from stated dimensions, so you can make a decision on whether that is okay or not. Washing instructions - I wash quilts in cold water and medium dry. Totes will need to be washed using delicate cycle and medium dry. Spot clean base piece. Please clean dryer lint filter periodically during drying time. Rag quilts will have fibers on them for the first few washes, so a lint roller is helpful. I try to make sure my photographs represent the item's true color to the best of my ability. However, monitor colors vary dramatically and no matter how good a color looks on my monitor, I have no control of what it will look like on yours. I do offer a verbal description of the color(s), but that may leave even more open to interpretation. Be aware that the actual color(s) may vary from your expectations. If you have any questions or concerns about an item's color, please convo me and I'll try to provide greater details. CUSTOM ORDER POLICY - No refunds on custom orders. Custom orders (including Pick Your Fabrics Listings) are not included in shop sales. Usually new fabrics need to be ordered which are almost always more expensive than ready to ship items in my shop. I do require 100% upfront payment. Turnaround time can be found in my shop message on my main page. Sometimes I can get started right away or it may take 3-4 weeks. It will depend on how many orders I'm working on and the length of time to finish your order. I will keep you updated, but you can always send me a convo if you have questions.